In the fifthteenth Century in a town called Sultanpur in Northern India, a young man named Nānak loved to bathe in a cold river before meditating every morning. It is said that one morning he submerged into the water, and did not come up for three days. It was called Jal Samādhī, or merger with the One in the water. After this experience, he became known as Gurū Nānak. In this underwater meditation there was a process of self election, where Gurū Nānak chose to sit in that deep space of meditation to merge with God, but then God also chose Gurū Nānak to sit there. In the 16th Paurī of Jap Jī Gurū Nānak calls this mutual election process between God and the human being Panch Paravāṉ the chosen ones. In that deep state of meditation he came to the place of Sach Khanḏ or the “True Home,” as he tells us in the 37th Paurī. That true home became firmly established not only within the heart and physical presence of Gurū Nānak but then through the sacred recitations that he gave us, the first of which is the Mūl Mantra—which begins Jap Jī. Many sacred recitations were to follow, beautiful poems of union with the Divine as Gurū Nanāk traversed much of India and other surrounding lands, teaching people through these poems, and through his divine wisdom and presence. Even after he left a village, there was an energy that seemed to live on through these poems, and this was the birth of Shabad Gurū, where the sacred sound current became the teacher. After Gurū Nānak left his body the Gurūship was passed on to nine living Masters, each of them contributing unique and powerful teachings for humanity, covering the full spectrum of the saint to the warrior. The consciousness of these teachings would be honored, sanctified and preserved in the sacred poetry that came from many of the Sikh Gurūs. The fifth Gurū compiled many of these writings along with enlightened Masters of the Sufi, Hindu and Muslim faiths in what became known as the Adī Granth, or the original sacred text. As the tenth Gurū prepared to leave his body, instead of appointing a human successor he put the Gurūship into these sacred writings which then became known as the Sirī Gurū Granth Sāhib. This body of writing is a living, breathing entity. Sikhs across the globe look to this energy for daily guidance. It does not contain doctrines, or religious laws. 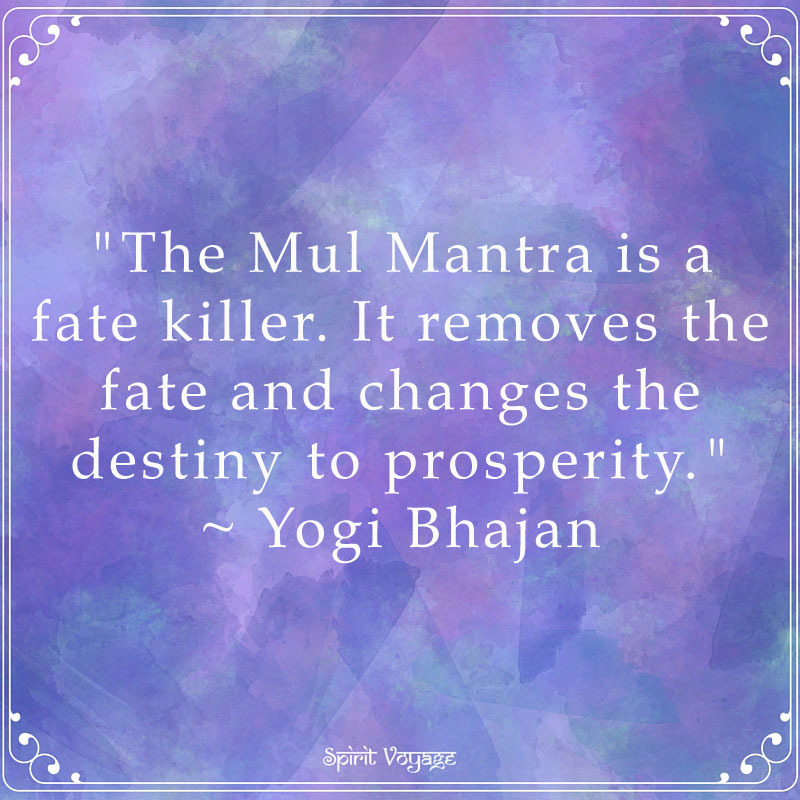 In fact the only command within it, as I remember the Siri Singh Sahib Yogi Bhajan stating, exists within the Mūl Mantra, and that command is, Jap. Meditate! To understand how the Sirī Gurū Granth Sāhib works as a flow of consciousness we must be willing to experience it in our own self election process, in our own capacity to feel its vibration. 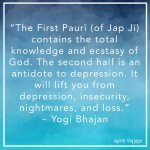 In fact, I remember the Siri Singh Sāhib Yogi Bhajan teaching us that if you want to understand all 1430 pages of the Sirī Gurū Granth Sāhib, understand Jap Jī, and if you want to understand Jap Jī, understand the Mūl Mantra, and if you want to understand the Mūl Mantra, understand the first word in the Mūl Mantra, and that is Ek Ong Kār. So lets begin there and let’s do it from a place of self experience and self initiation in the spirit of Gurū Nānak. Allow Ek Ong Kār to bring you into the awareness that God, who is One, exists within all beings (including you.) Perhaps as human beings the greatest challenge we face is the capacity to have self acceptance, self love. Know that God is fully within you, that God is fully you, and that you are fully God. Can you feel Divine? Then let’s take that a step further and feel that Divinity within all beings. That is the gift of Gurū Nānak. satinām: Truth is God’s Name. Gurū Nānak tells us that all creation emanates from the vibration of God’s Name. So as God’s Name vibrates, we come into existence; the sound creates the noun—the “I am,” the Nām. When we chant Sat we vibrate the energy of truth. When we chant Satinām, we are chanting “Truth I am,” or “Truth is my identity.” We affirm that truth prevails within us and within all beings. karatā purakh: God is the Doer. Let’s really believe it, let’s really feel it. Let’s let God be the Doer. Let’s take a step back from our lives, our worries, and cares and all that is happening in this world and see it as God’s play. Wow, for me that is such a wonderful feeling. Yes, I have to be present, yes I have to be real, yes I have to be true… but with God as the doer there is a lightness of being that prevails. nirbha-u: To live without fear; nirvair: to live without anger. There’s absolutely nothing wrong with fear and anger. It is only when we allow these energies to guide our consciousness that we get in trouble. Instead these energies are simply there to show us where we need to grow within ourselves. As we recite these sacred words we loosen the grip of fear and anger within, so that we can see those energies for what they are, and instead of getting caught in them, find the way to healing. akāl mūrat: the undying form. We received this incredible gift of the human body which has the privilege to carry the soul. Each soul is connected to all souls, and is in union with the Great Cosmic Soul. Within each of us is that essence! When we dress with grace, elegance, in acknowledgement of this sacred identity within, we are experiencing the power of the akāl mūrat, or the undying form. ajūnī: We live beyond the constraints of birth and death and tap into the timeless energy within, so that we can live for legacy and serve the future. saibhang: Known as the self-illumined will of your spirit. This is the twinkle in your eye and the inner smile that brings hope to your day. We each have this capacity, and when we exercise it at will, we find the way to our personal freedom and joy. gur prasād: This is the Gurū’s grace, the hand of the Divine that brings us liberation. There is a touch and a grace that we receive. We are blessed. We did not get here on our own, by the will of our own egos. A sacred energy guided us here, and we acknowledge that it exists and will continue to guide us along the way. jap: meditate! Let us follow this singular command of Gurū Nānak, to meditate with focus, purity and intention so that we can shift our inner cellular structures from a state of disconnection and chaos to an experience of Divine resonance. Yogi Bhajan, The Master’s Touch (Santa Cruz, NM: Kundalini Research Institute, 1997), 97. Snatam Kaur is an American Kīrtan singer and peace activist raised in the Sikh and Kundalini Yoga tradition as taught by the Siri Singh Sahib, Yogi Bhajan. She is known internationally for her ability to transform traditional chants into a contemporary sound that appeals to the modern ear and awaken an ancient yearning in the soul. While traveling across the globe on tour, she also teaches the art and science of Shabad Guru the experience of transformation through sound from the Sikh tradition. 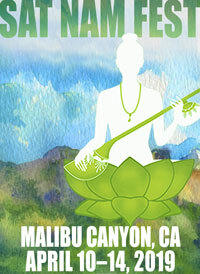 For more information, please visit snatamkaur.com. Guru Nanak lebte im 15. Jahrhundert in Nordindien. Als junger Mann badete er gerne vor seiner Meditation in einem Fluss. Eines Tages tauchte er in das Wasser ein und kam erst nach drei Tagen wieder an die Oberfläche. Dieses Eintauchen und die Einswerdung mit dem Göttlichen wird Jal Samādhī genannt. Nach diesem Erlebnis wurde aus dem jungen Mann Gurū Nānak. Guru Nanak traf die Wahl unter Wasser zu bleiben und das Göttliche traf die Wahl, Guru Nanak dort sitzen zu lassen. Dieser Prozess des Wählens wird Panch Paravāṉ genannt. Im 37. Pauri spricht Guru Nanak vom Sach Khanḏ oder dem “Wahren Zuhause.“ Dieses wahre Zuhause kann in uns durch das Rezitieren des Jap Ji etabliert werden. Das Jap Ji beginnt mit dem Mul Mantra. Siri Singh Sahib, Yogi Bhajan. Gurū Nanāk verfasste viele Dichtungen und diese Werke bildeten den Grundstein für den Shabad Gurū. Neun Gurus folgten auf Guru Nanāk und jeder einzelne von ihnen lehrte und dichtete. Die Weisheit und die Schönheit dieser Lehren wurden geehrt. Der fünfte Guru sammelte viele dieser Werke, aber auch Schriften anderer erleuchteter Meister. Diese Sammlung nannte er Adī Granth. Der zehnte Guru bestimmte die Schriften zu seinem Nachfolger. Das Buch erhielt nun den Titel Sirī Gurū Granth Sāhib. Es enthält keine Doktrinen oder religiöse Gesetze und Sikhs auf der ganzen Welt lesen täglich darin. Yogi Bhajan sagte einmal, dass der einzige Befehl, der in diesem Buch vorkommen würde, in dem Mul Mantra zu finden sei. Es ist das Wort Jap. Meditiere! Yogi Bhajan sagte einmal, wenn man alle 1430 Seiten des Sirī Gurū Granth Sāhib verstehen wollte, dann sollte man das Jap Ji begreifen lernen und um das Jap Jī zu verstehen, sollte man sich das Mul Mantra anschauen und das erste Mantra verstehen und das ist Ek Ong Kār. Ek Ong Kār bedeutet, dass Gott in allen Wesen existent ist (auch in dir) und dass Gott eins ist. Dieses Mantra stärkt die Selbstakkzeptanz und die Selbstliebe. Das Göttliche ist ganz in dir und du bist ganz Gott. Gott ist in allen Wesen, das ist das Geschenk von Guru Nanak. Satinām: Gottes Namen ist Wahrheit Wenn wir Satinām chanten, dann sagen wir “Ich bin Wahrheit” oder “Meine Identität ist Wahrheit.” Wir bekräftigen, dass die Wahrheit in uns selbst und in allen Wesen existent ist. karatā purakh: Gott ist der Handelnde. Wenn du das wirklich so annimmst, dann kannst du innerlich ein wenig zurücktreten und Gott machen lassen. Es ist wichtig wirklich und wahrhaftig da zu sein, aber mit dem Göttlichen als Handelnden ist Dasein viel leichter. nirbha-u: das Leben ohne Angst, nirvair: das Leben ohne Wut. Wut und Ärger gehören zum Leben dazu, aber sie sollten nicht die bestimmenden Kräfte in unseren Leben sein. Wenn wir diese heiligen Worte singen, dann lösen wir uns aus der Umklammerung dieser Emotionen und können leichter einen Weg der Heilung finden. akāl mūrat: die unsterbliche Form. In unserem menschlichen Körper existiert die Seele. Jede Seele ist mit allen anderen Seelen verbunden und alle Seelen sind mit der großen kosmischen Seele vereint. ajūnī: Wir leben jenseits der Begrenzungen von Geburt und Tod. Wir kommen mit der zeitlosen Energie in uns in Kontakt. saibhang: bezeichnet den selbsterleuchtenden Willen unseres Geistes. Es ist das Augenzwinkern und das innere Lächeln, das uns Hoffnung schenkt. So können wir unseren Weg zur persönlichen Freiheit und zur Freude finden. gur prasād: ist das Geschenk des Gurūs, die göttliche Hand, die uns Befreiung schenkt. Wir sind schon gesegnet. jap: Meditiere! Folgen wir also diesem einzigen Befehl Gurū Nanāk’s und lasst und fokussiert und mit einer reinen Intention meditieren. 1. Bhajan, The Aquarian Teacher, Seite 80. 2. Yogi Bhajan, The Master’s Touch (Santa Cruz, NM: Kundalini Research Institute, 1997) Seite 97. 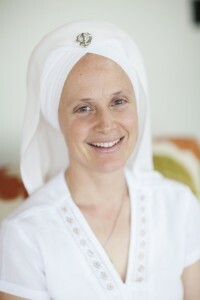 Snatam Kaur ist eine amerikanische Kirtansängerin und Friedensaktivistin, die in einer Sikhfamilie aufwuchs und in der Tradition des Kundalini Yoga erzogen wurde. Über 30 Jahre lang studierte sie bei ihrem spirituellen Lehrer Yogi Bhajan. Seit über 15 Jahren unterrichtet sie Naad Yoga, Kundalīnī Yoga & Meditation und Kirtan oder teilt ihre Kenntnisse mittels ihrer CD Aufnahmen, Konzerte und Workshops. Der Kern von Snatam Kaurs Praxis ist eine essenzielle Erfahrung von Frieden. Menschen aus allen Bereichen des Lebens haben die heilenden Auswirkungen dessen schon wahrnehmen können. Snatam Kaur hat die wunderbare Fähigkeit, traditionelle Chants in zeitgenössische Musik umzuwandeln, die reizvoll für die/den modernen Zuhörer(in) ist und gleichzeitig eine uralte Sehnsucht der Seele erwachen lässt. Snatam Kaur ist es ein tiefes Anliegen, während ihrer weltweiten Tourneen Yoga und Meditation für Kinder und Erwachsene gleichermaßen zu unterrichten. Es ist ihr Pflicht und Freude zugleich, Menschen Werkzeuge an die Hand zu geben, mit denen sie täglich ihren inneren Frieden erfahren können. Kontakt: snatamkaur.com. Yogi Bhajan，大师的触碰 （昆达里尼瑜伽研究院，出版社Santa Cruz, NM 1997)，P 97. SnatamKaur 是美籍kirtan歌手，和平使者，她自小就生活在锡克教以及由Siri Singh Sahib, Yogi Bhajan所教授的昆达里尼瑜伽的耳濡目染之中。她擅长于将古老的唱诵转化为新时代的声音而吸引现代人的耳朵并唤醒他们灵魂中幽深的渴望，并因此而享誉全球。此外，她也在世界各地一边旅行，一边教授音流科学的艺术——基于锡克传统的音声的转化体验。想要了解更多信息，请访问snatamkaur.com. En el siglo quince en un pueblo llamado Sultanpur en el norte de India, un joven hombre llamado Nānak amaba bañarse en un rio frio antes de meditar cada mañana. Se dice que una mañana se sumergió en el agua y no subió hasta durante tres días. Se llamaba Jal Samadhi o fusión con el Uno en el agua. Después de esta experiencia, se hizo conocido como Gurū Nānak. En esta meditación bajo agua hubo un proceso de auto elección, donde Gurū Nānak eligió sentarse en ese profudno espacio de medtiacion para unirse con Dios, pero entonces Dios también eligió a Gurū Nānak para sentarse ahí. En el 16° Pauri del Jap Jī Gurū Nānak llama a este proceso de elección mutua entre Dios y un humano como Panch Parvan los elegidos. En ese estado de meditación profunda llego al lugar Sach Khand o el “Verdadero Hogar” como nos dice en el 37° Pauri. Ese verdadero hogar se estableció firmemente no solo dentro del corazón y la presencia física de Gurū Nānak, sino luego a través de las recitaciones sagradas que nos dio, el primero de los cuales es el Mūl Mantra –que comienza el Jap Jī. Muchas recitaciones sagradas se debían seguir, hermosos poemas de la unión con la Divinidad como Gurū Nānak atravesaron gran parte de la India y otras tierras de los alrededores, enseñando a la gente a través de estos poemas, y a través de su sabiduría divina y presencia. 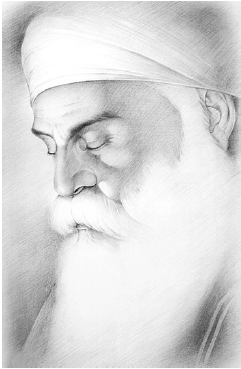 Aun cuando dejo la aldea, había una energía que parecía vivir a través de esos poemas, y este fue el nacimiento del Shabad Guru, donde la corriente de sonido sagrado se convirtió en el maestro. Después que Gurū Nānak dejara su cuerpo el Gurūado paso a nueve maestros vivientes, cada uno contribuyo con enseñanzas únicas y poderosas para la humanidad, cubriendo todo el espectro de santo a guerrero. La conciencia de estas enseñanzas serian honradas, santificadas y preservadas en la poesía sagrada que vino de muchos Gurús Sikhs. El quinto Gurú compiló muchos de estos escritos junto con los maestros iluminados de sufí, hindúes y creencias musulmanes que se conoció como el Adi Granth, o el texto sagrado original. A medida que el décimo gurú se preparaba para dejar su cuerpo, en lugar de nombrar un sucesor humano puso el Gurūado en estos escritos sagrados que luego se conoció como el Siri Gurū Granth Sahib. Este cuerpo de estritutas es una entidad que vive y respira. Sikhs de todo el mundo miran esta energía como guía diaria. No contiene doctrinas, o leyes religiosas. De hecho el único comando dentro de él, como recuerdo que el Siri Singh Sahib Yogi Bhajan indicó, existe dentro del Mūl Mantra, y ese comando es, Jap. ¡Medita! Para entender cómo el Siri Gurū Granth Sahib funciona como un flujo de conciencia, debemos estar dispuestos a examinar en nuestro propio proceso de auto elección, en nuestra propia capacidad de sentir su vibración. De hecho, recuerdo al Siri Singh Sahib Yogi Bhajan enseñándonos que si se quieren entender las 1430 páginas del Siri Gurū Granth Sahib, entiendas el Jap Jī, y si quieres entender el Jap Jī, entiende el Mūl Mantra, y si quieres entender el Mūl Mantra, entiende la primera palabra en el Mūl Mantra, y esa es Ek Ong Kar. Así que vamos a empezar ahí y vamos a hacerlo desde un lugar de experiencia propia y auto iniciación en el espíritu de Gurū Nānak. Permite que el Ek Ong Kar te traiga a la conciencia de que Dios, que es Uno, existe dentro de todos los seres (incluido tu). Tal vez como seres humanos el mayor reto al que nos enfrentamos es la capacidad de tener aceptación propia, amor propio. Que sepas que Dios está plenamente dentro de ti, que Dios es totalmente tú, y que tú eres plenamente Dios. ¿Puedes sentirte Divino? Entonces tomemos ese paso más allá y siente la Divinidad dentro de todos los sers. Ese es el regalo de Gurū Nānak. satinām: La Veredad es el Nombre de Dios. Gurū Nānak nos dice que toda la creación emana de la vibración del Nombre de Dios. Así como el nombre de Dios vibra, nosotros existimos; el sonido crea el sustanivo –el “Yo soy”, el Nam. Cuando cantamos Sat vibramos la energía de la verdad. Cuando cantamos Satinām, cantamos “la Verdad que Soy”, o “Verdad es mi Identidad”. Afirmamos que la verdad prevalece detnrod e nosotros y dentro de todos los seres. karata purakh : Dios es el Hacedor. Vamos a creerlo realmente, vamos a sentirlo realmente. Dejemos que Dios sea el Hacedor. Vamos a dar un paso atrás en nuestras vidas, en nuestras preocupaciones y cuidados y todo lo que sucede en este mundo y veámoslo como un juego de Dios. Guau, para mí eso es un sentimiento tan maravilloso. Sí, tengo que estar presente, sí tengo que ser real, sí tengo que ser verdad… pero con Dios como el hacedor hay una levedad del ser que prevalece. nirbha -u : Para vivir sin miedo; nirvair: vivir sin ira. No hay absolutamente nada de malo con el miedo y la ira. Es sólo cuando permitimos que estas energías guíen nuestra conciencia que nos metemos en problemas. En lugar estas energías están simplemente allí para mostrarnos donde tenemos que crecer dentro de nosotros mismos. Mientras recitamos estas palabras sagradas relajamos el agarre del miedo y la ira en el interior, para que podamos ver esas energías para lo que son, y en lugar de quedar atrapados en ellos, encontramos el camino a la curación. akāl mūrat: la forma imperecedera. Recibimos este increíble don del cuerpo humano que tiene el privilegio de llevar el alma. Cada alma está conectada a todas las almas, y está en unión con la Gran Alma Cósmica. ¡Dentro de cada uno de nosotros está la esencia! Cuando nos vestimos con gracia, elegancia, en reconocimiento de esta identidad sagrada interna, estamos experimentando el poder del akāl mūrat, o la forma imperecedera. ajūnī: Vivimos más allá de las limitaciones del nacimiento y la muerte y el grifo en la energía intemporal interna, para que podamos vivir por herencia y servir al futuro. saibhang: Conocida como la voluntad de auto-iluminación de tu espíritu. Este es el brillo en tus ojos y la sonrisa interior que trae esperanza a tu día. Cada uno de nosotros tenemos esta capacidad, y cuando la ejercemos a voluntad, encontramos el camino a nuestra libertad personal y a la alegría. Gur Prasad: Ésta es la gracia del Gurú, la mano de lo Divino que nos trae la liberación. Hay un toque y una gracia que recibimos. Estamos bendecidos. No llegamos aquí por nosotros mismos, por la voluntad de nuestros propios egos. Una energía sagrada nos guió aquí, y reconocemos que existe y continuará guiándonos en el camino. jap: ¡Medita! Sigamos este único mando de Gurū Nānak , a meditar con enfoque, pureza e intención para que podamos cambiar nuestras estructuras celulares internas de un estado de desconexión y el caos a una experiencia de resonancia Divina. 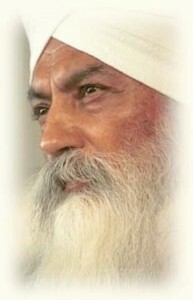 Yogi Bhajan, El Toque del Maestro (Santa Cruz, NM: Kundalini Research Institute, 1997), 97. No Século XV em uma cidade chamada Sultanpur no Norte da India, Um jovem homem chamado Nanak adorava se banhar em um rio frio antes de meditar cada manhã. É dito que em uma manhã ele submergiu na água e não retornou à superfície por três dias. Isso era chamado de Jal Samadhi, que é se fundir com o Um na água. Depois dessa experiência, ele passou a ser conhecido como Guru Nanak. Na sua meditação dentro da água houve um processo de auto-eleição, onde o Guru Nanak escolheu se assentar naquele espaço de meditação profundo para se fundir com Deus, ao mesmo tempo que Deus também escolheu Guru Nanak para se assentar ali. 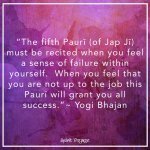 No 16º Pauri do Jap Ji, Guru Nanak chama de Pânch Pârâvan, os escolhidos, esse processo de eleição mútua entre Deus e o humano. Naquele espaço profundo de meditação ele chegou a um lugar chamado Sâch Khând ou a “Casa Verdadeira”, como ele conta no 37º Pauri. Essa casa verdadeira foi solidamente estabelecida não apenas no coração e na presença física do Guru Nanak mas também através das recitações sagradas que ele nos deu. E a primeira delas é o Mul Mantra – que inicia o Jap Ji. Muitas recitações sagradas vieram depois, belos poemas de união com o Divino uma vez que o Guru Nanak cruzou grande parte da India e outras terras próximas, ensinando as pessoas através desses poemas, e através da sua sabedoria e presença divina. Mesmo depois que ele saía de uma vila, permanecia lá uma energia que vivia através desses poemas, e esse foi o nascimento do Shabad Guru, onde o som sagrado tornou-se o professor. Depois que o Guru Nanak deixou o seu corpo, o Guruship passou para nove Mestres vivos que o seguiram, cada um deles contribuindo com ensinamentos únicos e poderosos para a humanidade, cobrindo todo o espectro que vai do santo ao guerreiro. A consciência desses ensinamentos foi honrada, santificada e preservada na poesia sagrada que veio de vários dos Guru Sikhs. O quinto Guru compilou muito desses escritos conjuntamente com escritos de Mestres iluminados das fés Sufi, Hindu e Mulçumana no que ficou conhecido como Adi Granth, ou o texto sagrado original. Quando o décimo Guru se preparava para deixar seu corpo, ao invés de indicar um sucessor humano, ele colocou o Guruship nessas escrituras sagradas, que então passaram a ser conhecidas como o Siri Guru Granth Sahib. Esse corpo de escritos é uma entidade viva e real. Sikhs ao redor do mundo se conectam com essa energia para orientação diariamente. Ele não contém doutrinas ou leis religiosas. Na verdade, o único comando que está nele – lembrando o que dizia o Siri Singh Sahib Yogi Bhajan, está dentro do Mul Mantra, e esse comando é: Jap. Medite! Para compreender como o Siri Guru Granth Sahib funciona como um fluxo de consciência nós precisamos querer experimentá-lo no nosso próprio processo de auto-eleição, na nossa própria capacidade de sentir a sua vibração. Eu me lembro do Siri Singh Sahib Yogi Bhajan nos ensinando que se você quiser compreender todas as 1430 páginas do Siri Guru Granth Sahib, compreenda o Jap Ji. E se você quiser compreender o Jap Ji, compreenda o Mul Mantra. E se você compreender o Mul Mantra, compreenda a primeira palavra no Mul Mantra, que é Ek Ông Kar. Vamos então começar aí, e vamos fazer a partir da auto-experiência e da auto-iniciação, que é o espírito do Guru Nanak. Permita que o Ek Ông Kar traga você para a consciência que Deus, que é o Um, existe dentro de todos os seres (incluindo você). Talvez como seres humanos o grande desafio que nós enfrentamos é capacidade de se auto-aceitar, de se auto-amar. Saber que Deus está completamente presente em você, que Deus é totalmente você, e que você é totalmente Deus. Você pode se sentir Divino? E aí vamos dar um passo à frente e sentir que essa Divindade existe em todos os seres. Esse é o presente do Guru Nanak. sâtenam: Verdade é o Nome de Deus. Guru Nanak nos ensina que toda criação emana da vibração do Nome de Deus. Dessa forma, quando o Nome de Deus vibra, nós passamos a existir. O som cria o nome – o “Eu sou”, o Nam. Quando nós entoamos Sat nós vibramos a energia da verdade. Quando nós entoamos Sâtenam, nós estamos entoando, “Eu sou a verdade”, ou “A verdade é a minha identidade”. Nós afirmamos que a verdade prevalece dentro de nós e dentro de todos os seres. kârâta purâkh: Deus é aquele que faz. Vamos realmente acreditar nisso. Vamos realmente sentir isso. Vamos permitir Deus ser aquele que faz tudo. Vamos dar um passo atrás em relação às nossas vidas, preocupações, precauções e tudo o que está acontecendo nesse mundo e ver tudo como o jogo de Deus. Uau, para mim esse é um sentimento maravilhoso. Sim, nós temos que estar presentes; sim, nós temos que ser reais; sim, nós temos que ser verdadeiros… mas com Deus como o executor de tudo existe há uma luz que prevalece. nerâbhâ-u: Viver sem medo; nerâvér: viver sem raiva. Não há absolutamente nada errado em sentir medo e raiva. É somente quando nós permitimos que essas energias guiem nossa consciência que nós criamos um problema. Ao contrário essas energias estão ali simplesmente para nos mostrar onde nós precisamos crescer internamente. Na medida em que vamos entoando essas palavras sagradas, nós vamos soltando as amarras do medo e da raiva interna, e assim podemos ver essas energias no sentido real delas. Assim, ao invés de sermos pegos por elas, nós encontramos a rota para cura. âkal mûrât: a forma que nunca morre. Nós recebemos esse presente incrível do corpo humano que tem o privilégio de carregar a alma. Cada alma está conectada a todas as almas, e em união à Grande Alma Cósmica. Dentro de cada um de nós está essa essência! Quando nós nos vestimos com graça, elegância, em reconhecimento à essa identidade sagrada interna, nós experimentamos a força do âkal mûrât, ou a força que nunca morre. âjûní: Nós vivemos além da limitação do nascimento e da morte, em contato com essa energia eterna e interna, para que nós possamos viver para deixar um legado e servir o futuro. gur prâsad: Essa é a graça do Guru, a mão do Divino que trás liberação para nós. É um toque e uma graça que nós recebemos. Nós somos abençoados. Nós não chegamos até aqui graças a nós próprios, pela vontade dos nossos próprios egos. Uma energia sagrada nos guiou até aqui, e nós reconhecemos que isso existe e continuará a nos guiar ao longo do caminho. jâp: medite! Vamos seguir esse comando único do Guru Nanak, para meditar com foco, pureza e intenção, mudando nossas estruturas celulares de um estado de desconexão e caos para uma experiência de ressonância divina. 1. Bhajan, The Aquarian Teacher, 80. 2. Yogi Bhajan, The Master’s Touch (Santa Cruz, NM: Kundalini Research Institute, 1997), 97. 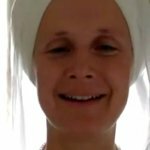 Snatam Kaur é uma cantora americana de Kirtan e uma ativista pela paz que cresceu na tradição Sikh e do Kundalini Yoga como ensinado pelo Siri Singh Sahib, Yogi Bhajan. Ela é conhecida internacionalmente pela sua habilidade de transformar cantos tradicionais em sons contemporâneos que são agradáveis aos ouvidos modernos e despertam um anseio primordial da alma. Enquanto viaja pelo mundo nas turnês, ela também ensina a arte e a ciência do Shabad Guru – a experiência de transformação da tradição Sikh através do som. Para mais informações, visite snatamkaur.com. Is there something on-line I should be tuning into at a specific time each day or is this just private practicing with face book postings. Is there a live daily event or are we practicing privately ‘together’ and chatting on line about our experience? We recommend practicing in the amrit vela – the hours between 4-7 am. We don’t have any live streaming going on…simply do your practice, and connect with the group on facebook for love, encouragement, and support. May your journey be blessed!